Well this forecast has escalated quickly. Welcome to March! We do have three chances for snow/rain over the next four days: Friday morning, Friday night to Saturday morning, and Sunday afternoon to Monday morning. These will be New Jersey's 10th, 11th, and 12th snow events (2+ inches) of the season. Before I dive into the details, I have to caution that the forecast for this wintry weather is highly volatile. For storms #2 and #3, somewhere in New Jersey, there will be a sharp cutoff between all rain and a lot of snow. It will be especially important to stay alert to advisories, watches, and warnings as they're issued. Of course, I'll be working through the weekend to bring you the latest "play-by-play" forecast updates. Current weather radar. Blue=Snow, Pink=Mix, Green=Rain. —Bottom Line... A quick burst of snow has already led to snow-covered roads and slippery conditions for the Friday morning commute. —Timeline... As of this writing, periods of light to moderate snow are wrapping up in New Jersey. Snowfall peaked around 5 a.m. to 6 a.m. and will taper off completely (from west to east) between 8 a.m. and 10 a.m. Scattered rain showers will be possible from late morning through the afternoon, especially south and coast. —Totals... As expected, the heaviest snowfall so far has been over the southern half of New Jersey. Our previous forecast looks OK — a coating to an inch statewide, with a more impactful 1 to 3 inches of accumulation in South Jersey. Per my usual rule, I do not issue a new snow map or detailed forecast once snow has started to fall — it is too confusing. Worth noting though that I've seen a few snow totals that are slightly higher than the forecast in North Jersey. —Confidence... Moderate to high. The storm is already here, and model consensus is very good for both totals and end time. —Advisory... A Winter Weather Advisory continues until 10 a.m. Friday for five counties in southwestern New Jersey: NW Burlington, Camden, Cumberland, Gloucester, and Salem. —Impacts... Snow-covered surfaces will be very slippery to walk/drive on. You might want to leave yourself some extra time on this Friday morning. In addition, our school delay list is growing rapidly. Our latest forecast (as of Friday morning) for winter storm #2, arriving Friday night. —Bottom Line... Our next storm system bubbles up late Friday evening. While we've ramped up our snowfall forecast a bit for this one, not everyone in New Jersey is going to see wintry weather this time around. —Timeline... 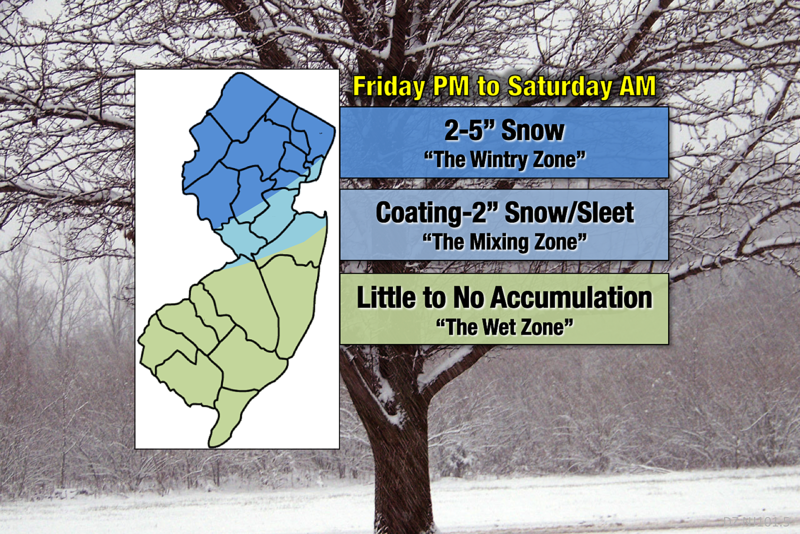 Initial precipitation will arrive in southern New Jersey as early as 7 p.m. Friday, spreading northward by Midnight. Heaviest precipitation is expected between Midnight and daybreak Saturday. Any remaining snow, mix, and rain will taper substantially after 8 a.m., ending completely by around Noon. Saturday afternoon will be mostly cloudy, breezy, and otherwise quiet. —Totals (North Jersey)... We'll likely see somewhere between 2 and 5 inches of snowfall across northern NJ, where this storm stays as south for the duration. —Totals (Central Jersey)... The trickiest area of the state to pinpoint will be around Mercer, Somerset, Middlesex, Monmouth, and Hudson counties, as we'll likely see a transition from snow to wintry mix (sleet and freezing rain) to rain. I decided to go with a conservative, reasonable estimate of a coating to a 2 inches here. A light glaze of ice (due to freezing rain) is also a possibility. —Totals (South Jersey)... As temperatures remain above freezing for the duration, the area of the state along and south of Interstate 195 will likely remain wet instead of wintry. Little to no accumulation and/or icing issues are expected. —Confidence... Medium. Over the last 24 hours, the forecast has trended much snowier by Saturday morning. Will that trend continue, or are models overdoing the snow potential? 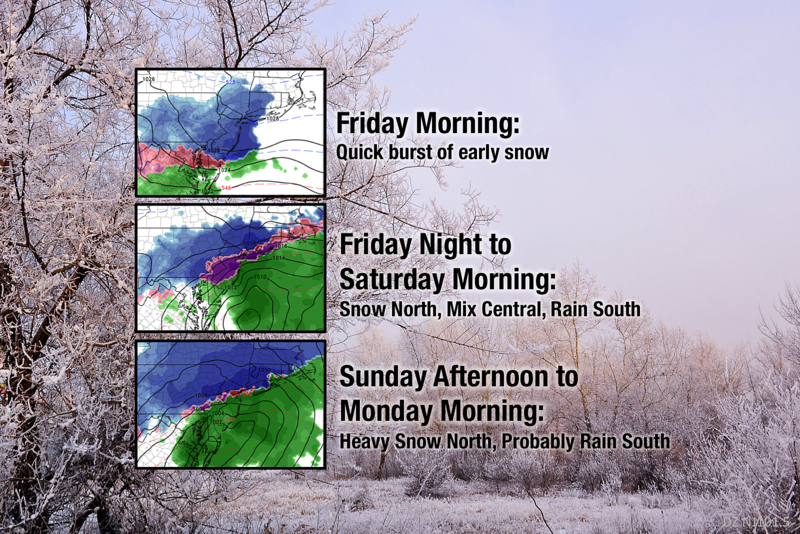 I'm fairly comfortable about the timeline and snow map I've presented here. But I caution that we'll almost certainly need to tweak it as the storm gets closer. —Advisories... Nothing yet. I suspect the National Weather Service will wait until Friday morning's snowfall ends before issuing Friday afternoon. I'm thinking advisories would be most appropriate for the "snow zone" of the state, but I wouldn't be surprised to see a few counties under a watch/warning (especially if the snowfall ramps up further). —Impacts... Luckily, this is mostly an overnight event, with no weekday commute to worry about. Still, if you have places to go and things to do on Saturday morning, be aware that roads may be treacherous. —Bottom Line... The most significant storm of the bunch. And the most volatile forecast. As it stands, this one will probably drop both "heavy snow" and "just rain" over the Garden State. —Timeline... This system is probably going to arrive hard and fast Sunday afternoon, spreading across the state by Sunday evening. (Initial precipitation will be snow north of I-195 and rain south of I-195.) As temperatures warm, the freezing line will drift northward, forcing a transition from snow to rain for the area between I-195 and I-78 (approximately). Storm system departs and precip will end by daybreak Monday morning. —Totals... I am not prepared to nail down precise totals and/or present a snow map yet — hopefully I'll be able to piece something together later Friday. In NW NJ, it is totally possible we see snowfall on the order of 8 to 12 inches. In SE NJ, it is totally possible that exactly zero snow falls and it's all rain. Somewhere in New Jersey, there will be a line between "substantial snow" and "mostly wet". Where that line ends up? I'm just not ready to pinpoint it 60 hours in advance. —Confidence... Low. We're confident there's going to be a storm, with at least some wintry impacts in New Jersey. I'll even go so far as to say snowfall may be significant for part of the state. There is a mounting consensus among model guidance (NAM, Euro, Canadian) pointing to a "lots of snow north, lots of rain south" solution. 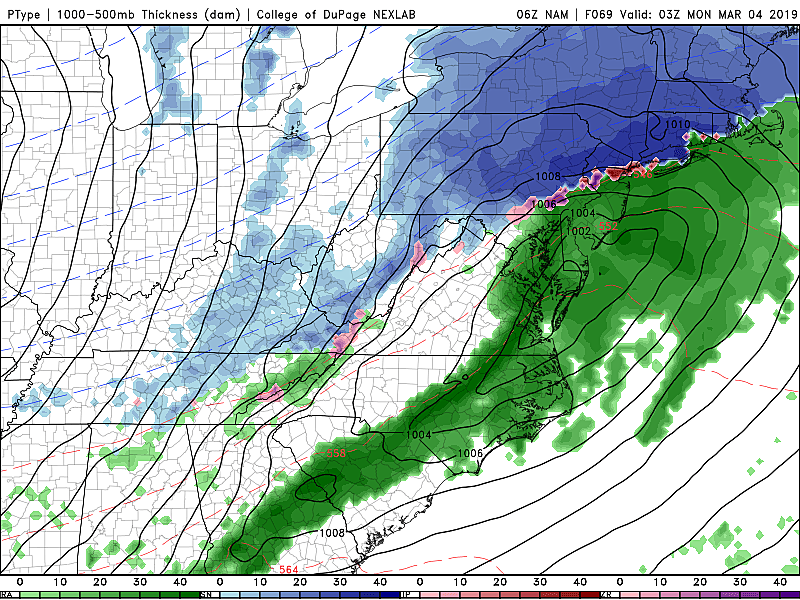 But the GFS and UKMET keep the heaviest precipitation and freezing temperatures farther south, putting heavier snow over central and southern NJ. Several solutions remain in play, and that's why I just don't feel comfortable putting a specific map out there yet. —Advisories... Obviously, nothing has been issued yet. But this could be a "warning-level" event for part of the state. Watches would be issued on Saturday, and warnings (and/or advisories) on Sunday. —Impacts... I've been saying for days that this storm is the most ominous of the trio — and potentially the biggest winter storm of the season. (For whoever ends up in the snow bullseye, at least.) Monday morning's commute will be heavily impacted. And, if the forecast holds, there could be widespread school delays and closings throughout the northern half of the state. However, let me stress again this is a highly volatile forecast, subject to change dramatically as we get closer. I highly recommend you stay alert to the latest forecast update, in addition to any advisories, watches, and warnings that are issued. Our next threat of snow will hold off until late next week, around Friday. Be smart and stay safe out there!